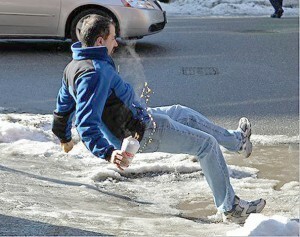 Mr W. suffered a serious fall as a result of slipping on ice in a hospital car park. Our Lawyer took on the case and pursued a claim against the hospital foundation trust to secure compensation for the injuries that Mr W. suffered following the fall. As he was walking towards the pay machine in the car park of a major hospital our Client slipped and fell on ice. He had to attend accident and emergency following the incident to receive treatment for his injuries. With the help of Stonehewer Moss Mr W. received £12,611 compensation following his accident. This article was added on Thursday, April 16th, 2015 at 3:36 pm and is categorised under . Both comments and pings are currently closed. Error: Error validating access token: Session has expired on Saturday, 09-Mar-19 13:12:58 PST. The current time is Thursday, 25-Apr-19 05:55:04 PDT.